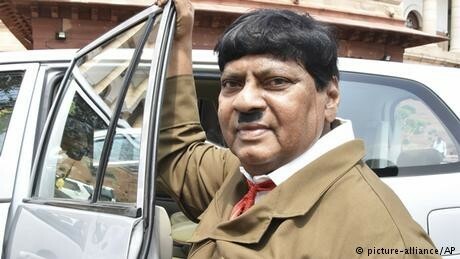 An Indian lawmaker appeared in Parliament dressed like Adolf Hitler in an attempt to demand more funds for the development of his state of Andhra Pradesh in southern India. Naramalli Sivaprasad, a former actor, also raised his hand in a Nazi salute for the media. But his stunt did not seem to bother fellow lawmakers, who seemed rather amused and entertained. The 67-year-old has is known to don costumes of famous figures, including Hindu god Rama, to raise political causes. He has also previously dressed as a farmer, a cattle herder, a Muslim cleric and a woman. Sivaprasad said he wanted to send a message to Prime Minister Narendra Modi not to follow Hitler. "He does not get the pulse of what people want and I want to urge him to not be like him [Hitler]," he said. In March, Sivaprasad's Telugu Desam Party (TDP) walked out of the ruling coalition, saying that Modi had gone back on his promise to grant special funds for Andhra Pradesh state. TDP's leader is the chief minister of the state. Hitler carries a certain fascination in India, where the Holocaust is not well-known. The Nazi leader is widely seen as a strong leader, a nationalist who brought glory to his country. Prominent freedom fighter Subhash Chandra Bose met Hitler and sought his help in India's struggle for independence from the British. Hitler's race theories have found wide acceptance among many Hindu nationalists. The Nazi dictator's name and image have been used to sell ice-creams and apparels, among other things. In March, a publisher included Hitler in its book on great leaders.